Sanctions and nuclear plants are not the only bones of contention between Donald Trump and Kim Jong Un: while the US president likes his steaks well done, the North Korean leader has rarer tastes. 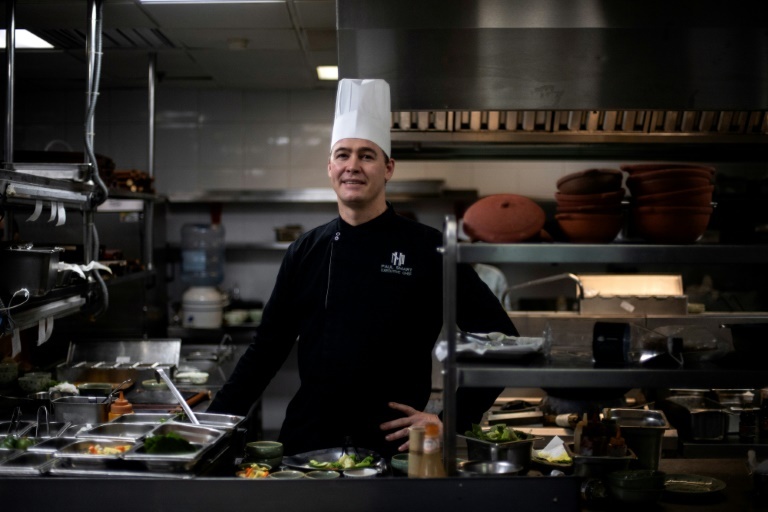 Paul Smart, the executive chef at the Metropole hotel in Hanoi, worked closely with two of the North Korean leader’s personal chefs on the meals prepared during the two-day summit. An intimate dinner on the first day featured marinated tender sirloin served with kimchi-stuffed pear, but the principals missed out on a foie gras and snow fish lunch as negotiations over the North’s weapons programmes and international sanctions ground to a halt. The US president is known for his simple culinary tastes, but Kim’s preference for bloodier meat showed an appreciation for quality, Smart said. Each side in the Metropole kitchen prepared dishes of its own, with the North Koreans bringing all their own ingredients — including the steaks, carried in a chilled metal container on board Kim’s train. The beef was “very natural and marbled, very red”, Smart said, suggesting that — as with Japanese wagyu — cattle may be allowed to roam free in North Korea. But aside from ox-drawn carts, bovines are a rare sight in the North Korean countryside. The impoverished country consistently fails to produce enough food to feed itself and according to the United Nations, more than 10 million people — around 40 percent of the population — need food aid. But for those who can afford it, there is an increasing number of coffee shops in Pyongyang, where restaurants offer cuisines ranging from Western to Japanese. Trump previously stayed at the Metropole during a state visit in 2017 — in the $4,800 a night top suite — when Smart stocked the freezer in his room with six tubs of vanilla ice cream to ensure his sweet tooth could be satisfied. On Wednesday Trump ate every last morsel of his chocolate lava cake dessert, while the main course was almost certainly the first time the US president has consumed North Korean beef. For an ordinary American citizen eating a steak provided by the North Korean leader could potentially violate the sanctions Washington has imposed on Pyongyang over its weapons programmes. In June 2016, the US Treasury designated Kim and other North Korean officials as subject to sanctions for their roles in human rights abuses by the North. Under Section 6 of Executive Order 13722, the legislation, which applied to Kim, US citizens are barred from receiving “goods” from any sanctioned person. But as US president on official business, the rule does not apply to Trump himself: another clause says that transactions “for the conduct of the official business of the Federal Government” are not prohibited. Sniffer dogs were brought in to sweep the kitchen ahead of the summit, and food samplers from both sides tasted each dish before it went out to the Metropole tables. “Everything was individually wrapped, it was very hygienically packed and everything,” Smart said of the North Korean supplies. The two chefs were talented and “very nice”, the Australian added, and “very intrigued by the way that we’re doing things and the style that we’re cooking”. They had one culinary blind spot: they had never before seen a shrimp cocktail, the 1980s American classic which Trump requested for the opening dinner. In return, they explained how to make kimchi, the fermented cabbage side dish that is a mainstay of Korean cuisine. For lunch on the summit’s second day, the North Koreans were responsible for the apple foie gras jelly appetisers — again providing their own ingredients, and carving long-beaked birds of out of a white seaweed jelly for presentation. “It was really kind of a masterpiece,” Smart said. They were laid out on the table, but the leaders never sat down as the summit deadlocked over Washington’s demand the North close its Yongbyon nuclear complex and Pyongyang’s desire for relief from UN Security Council sanctions. The leaders left without a signing ceremony or the scheduled meal, to the disappointment of the culinary team. Instead, hotel staff ate Smart’s main course of grilled snow fish, roasted vegetables and rice pilaf.